'A painting is never finished - it simply stops in interesting places' said the Scottish artist Paul Gardner, and it is the same with contemporary music. Back in November I thought I was broadcasting Alvin Curran's Inner Cities complete, but I was wrong. The epic 4 hour 24 minute cycle for solo piano had just stopped at an interesting place called Inner Cities 11. 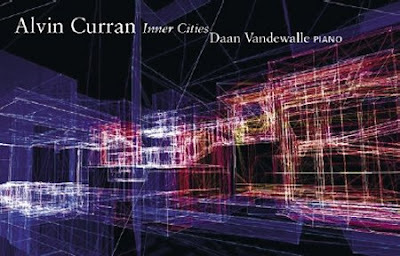 Pianist Daan Vandewalle tells me that two new Inner Cities have been added to the cycle, and another is in the pipeline. This week he recorded IC12 in Paris, he has performed IC13 in Italy, and is finalising a commission for Alvin Curran for IC14. I wonder what would have happened if Daan had been around when Wagner was composing the Ring? My next project is a marathon broadcast of Kaikhosru Sorabji’s Opus Clavicembalisticum for solo piano which also lasts for hour hours. Read about it here.